I have some advice for everyone following a bad team—and, as a result, all the top college quarterbacks—and it really boils down to two words: Chill out. 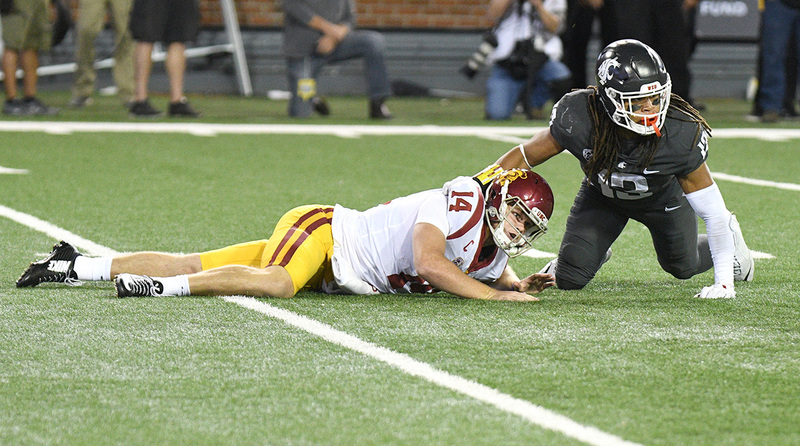 USC’s Sam Darnold looked like crap on Friday night at Washington State. He threw for 164 yards after crossing the 200-yard threshold in each of his first 14 starts. He fell below 60 percent completions for just the second time as a starter (he was at 57.1 percent against Texas on Sept. 16), and in Pullman was well below that mark (51.7). He didn’t throw a touchdown pass for the first time since his first start. And the truth is, that this wasn’t just the stats. Darnold really struggled, as the Trojans’ 13-game win streak, dating back to the quarterback’s second start, was snapped. Maybe we all got ahead of ourselves last month—I’ll raise my hand on that one. Darnold is 20, and will still be 20 on the day of the 2018 NFL draft. This was the first year he’d entered the season as a collegiate starter, he lost his No. 1 receiver (now-Steeler JuJu Smith-Schuster) and three All-Pac-12 linemen (the Giants’ Chad Wheeler and Cleveland’s Zach Banner at tackle, and Chiefs practice squad guard Damien Mama) to the NFL. Now that the hype train has finally slowed down, I talked to a number of NFL coaches and scouts who watched him play on Friday night—though this was before they’ve really broken down the tape—to try and get an idea of what the 20-17 road loss meant for Darnold’s stock. The first thing that came up was what the above scout mentioned, how Darnold needs better discipline in not staring down the receiver he’s going to. The best example came on his interception early in the second quarter, when Darnold took the snap, immediately looked to his left at Josh Imatorbhebhe, and stayed there long enough for Washington State corner Sean Harper to undercut the receiver. Second, in the Washington State game, Darnold’s eyes dropped. Those three linemen the Trojans lost from 2016? By the end of Friday night they were down three more, and more than one evaluator noticed that Darnold clearly didn’t trust the guys protecting him. As a result, he had happy feet for much of the night, looked to run more (a career-high nine rushing attempts), and missed throws he usually doesn’t. And, again, he was caught looking at the rush, most notably on the sack-fumble that clinched the win for the hosts. Third, Darnold’s forces throws. Scouts believe it’s happening more this year for three reasons: (1) he’s hyper-competitive; (2) he has a deep belief in his physical ability; and (3) with a young team around him, he knows he has to be really good. That, of course, is not unlike where Jameis Winston was during his final college season, during which he, like Darnold, had a young team around him. Now, the good news is that a lot of this is fixable. He can, and will, be coached on his eye discipline, which has been fine in the past. He can certainly learn to protect the ball better, and the coaches can work on getting him easy completions so he doesn’t feel the need to be a hero on every down. Also, it’s USC, so even if the team is young, it’s talented, and with experience that should show. The main thing here, though, is that this isn’t unusual. The fact that Deshaun Watson had 35 starts at Clemson—more than twice as many as Darnold has now—matters. By the time he declared for the draft, Watson had been faced with a lot of different challenges, the kind that Darnold’s working through now. So how about this? Let’s wait and see it how plays out. Darnold will have a decision to make on whether he’ll stay in school or go to the NFL—which I’ve heard could be impacted by which teams, and coaches, have high picks in April—after the season. By then, we should know a bunch more about where he is in his development. And all of that gives him plenty of time, including possibly the 2018 season, to work his issues out. ​1. 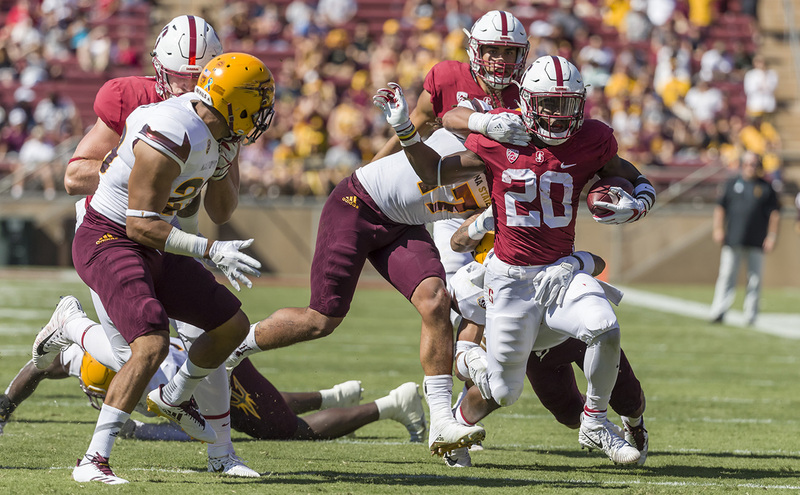 Stanford’s Bryce Love has landed on the draft radar. Since he’s a true junior, most scouts are catching up on him now—with his size (he’s listed at 5' 10", 196 pounds) being the big question. But there’s no arguing the production. Through five games, Christian McCaffrey’s heir is already at 1,088 yards, and has gotten there in less than 100 carries, averaging 11.1 yards per. He went for 301 against Arizona State for the rebounding Cardinal last week. 2. Speaking of running backs, nice to see Nick Chubb starring in his return to the scene of his grotesque 2015 knee injury. He rushed for 109 yards as the bellcow in Georgia’s 41-0 blowout of Tennessee. Chubb likely would’ve been a second- or third-round pick last year, had he declared. That he didn’t, because of his stock and the injury history, surprised people. It will be interesting to see if staying for his senior year pays off. 3. How can you not be impressed with Alabama? They’ve won their first two conference games by an aggregate score of 125-3 (not a misprint) and both finals, wins over Vandy and Ole Miss, could’ve been more lopsided. One thing that a scout pointed out to me—a key to the Tide’s continued dominance—is how they rotate players in, so even when they lose starters (Bama lost an SEC-high 11 this year), they bring back experience. A good example would be senior DE Da’Shawn Hand, who’s a first-year starter but was more than ready for his role and now is emerging as a top NFL prospect. 4. We had Auburn’s Jarrett Stidham as last week’s quarterback who helped himself, and Stidham kept rolling in the Tigers’ blowout of Mississippi State. The redshirt sophomore completed 13 of 16 throws for 268 yards and two touchdowns. It’s hard to project players from Gus Malzahn’s offense to the NFL, but as a former blue chip recruit, Stidham does have tools. 5. This is sort of a reaction from Sunday, but give Clemson credit for their ability to develop offensive players who are ready to play on Sundays. Deshaun Watson is just one of them. Sammy Watkins, Martavis Bryant and DeAndre Hopkins were all able to contribute early in their NFL careers, and Watson’s fellow rookie Wayne Gallman might soon be the Giants’ starting tailback. While some see the scheme there as spread, pro coaches know better—the Tigers work a lot of pro concepts into what they do. 1. 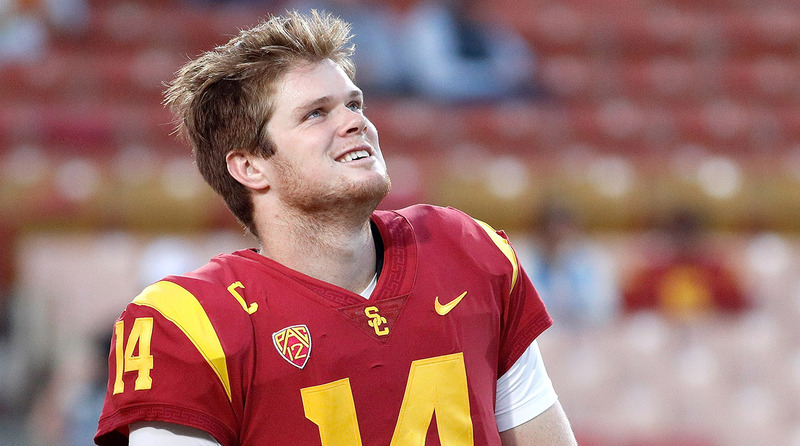 Sam Darnold, USC (17-24, 325 yds, 2 TDs, 0 INTs v. Stanford): The Trojans were hit hard by graduation before the year and injuries during it, and so Darnold deserves a lot of credit for guiding USC to its first conference title since the Pete Carroll era. He, in many ways, became the program’s margin for error as so many young players worked through growing pains. We’ll see whether or not he comes out. This much is for sure: Everything people have said about him as a player and a person showed up this year. 2. Josh Rosen, UCLA (DNP): The true junior still has questions about his personality and durability to answer, but few believed he was ever staying in 2018. The arrival of Chip Kelly probably seals his departure, since Kelly’s offense is a less-than-ideal fit for him. Interim coach Jedd Fisch has said he expects Rosen to play in the Cactus Bowl. 3. Josh Allen, Wyoming (DNP): It’s a foregone conclusion that Allen will declare after this, his redshirt junior season. The only question left there is whether he’ll play in the Famous Idaho Potato Bowl (yes, that’s the name of it) against Central Michigan. Allen gets points, as Darnold does, for getting the Cowboys through a rebuilding season. And if you add his off-the-charts tools to his uneven play, you get one of the 2018 draft’s most polarizing prospects. Helped Himself: J.T. Barrett, Ohio State (12-26, 211 yards, 2 TDs, 2 INTs vs. Wisconsin): Barrett didn’t look great throwing the ball against Wisconsin—he missed on a pair throws that would’ve been long touchdowns that could’ve blown the game open, and his unsightly pick-six in the first half kept the Badgers in it. But he played just six days after having arthroscopic surgery to address a meniscus injury that he’s played through all season, and he carried the ball 19 times. Barrett’s toughness and leadership precede him as the only three-time captain in Buckeyes history. And a night like Saturday night should, at least, pique the curiosity of NFL teams and give him a shot to win a roster spot in training camp. Hurt Himself: Jarrett Stidham, Auburn (16-32, 145 yards, TD vs. Georgia): The redshirt sophomore picked the wrong week to turn in his worst statistical effort of the season, as the Tigers were held to a single touchdown in their SEC title game loss to Georgia. The good news is that, for most of Auburn’s stretch run, he flashed tools that have caught the eye of evaluators, and now we know that Gus Malzahn is staying, which should help push Stidham’s development forward. Because only four guys on the list actually played this weekend, we have very little movement. Roquan Smith moves up a spot after a terrific SEC title game . . . And I’ll give Sam Darnold a little love, because of the way he’s handled a tough year and come away with a Pac-12 title . . . Connor Williams, by the way, has announced he’ll skip the Texas Bowl against Missouri to prepare for the draft. 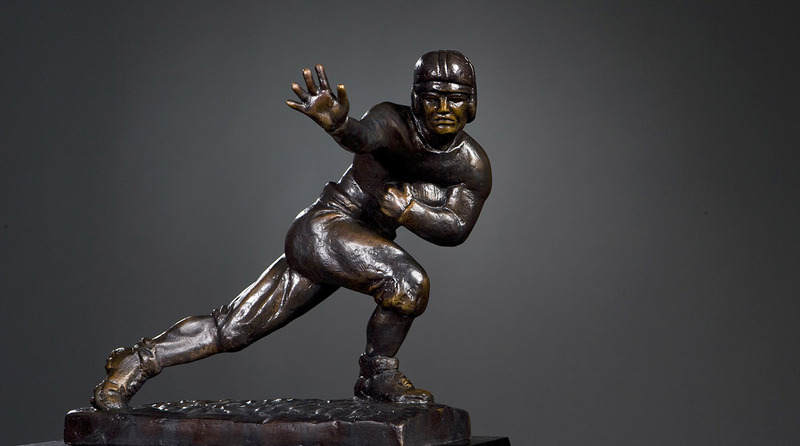 The Heisman Ceremony (Saturday, 8 p.m., ESPN): So Baker Mayfield is the winner over Stanford’s Bryce Love and reigning Heisman winner Lamar Jackson of Louisville. And as a reference point, Ohio State’s Troy Smith had the largest margin of victory in Heisman history, having taken 91.63% of the vote in 2006, a mark that Mayfield could best. Got it? We’re good? 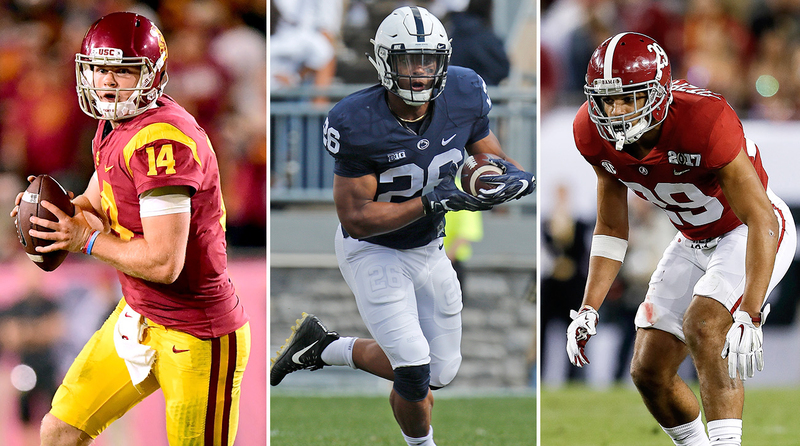 O.K., so here’s the other thing I’m watching in the coming days: Prospects deciding to skip their bowl games to prepare for the draft, like Christian McCaffrey and Leonard Fournette did last year. We’ve seen three(!) Texas players do it already. Two of the three are expected to go on Thursday (OT Connor Williams) or Friday (LB Malik Jefferson) of draft weekend, whereas S DeShon Elliott may have a tougher road.